…at parties and banquets I also perform a more formal cabaret ‘act’. It’s only formal in the sense that the audience has to be seated. It can be presented in front of a seated audience of 20 or more up to 150 depending on the size of the room, hall or even theatre. For more than 30 people ideally I need a platform or stage so that I am higher than the audience and they can all have a better view. It can also be presented in traditional cabaret style with the audience sat at tables around the room. 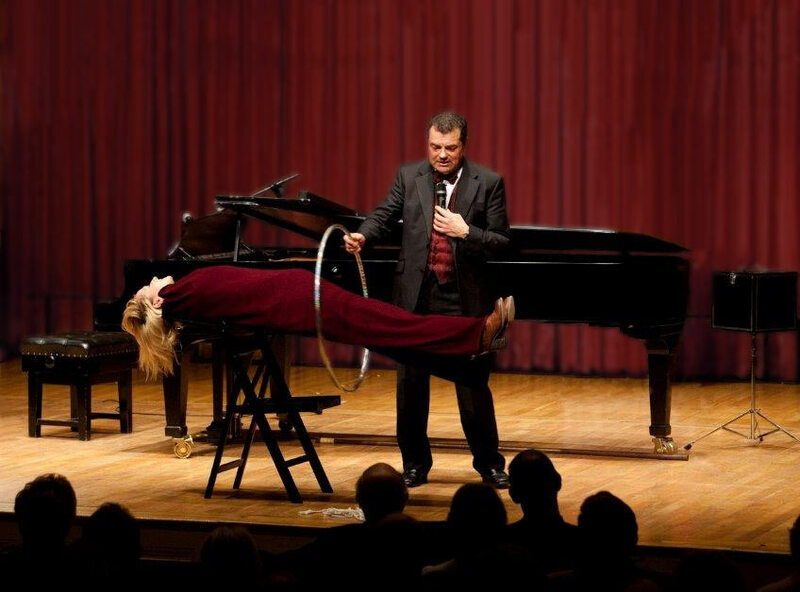 …of comedy magic sometimes using members of the audience as well a few rarely seen ‘stage illusions’ such as the ‘sawing a person in half’ using a member of the audience. There is also a levitation of an audience member which is a breathtaking feature and a unique spectacle as the finale of the act. The act is not serious and is intended as pure light entertainment which is suitable for all ages from 11 upwards but can be tailored to suit the age group. The act can be as short as 20 minutes and up to 45 minutes as required. Holiday centres, sports clubs, hotels, small scale theatres, pubs and community centres. Paul was superb as usual and not only did his spot on stage but also did table magic during the pre-entertainment dinner. A huge thank you for last night at our daughter’s 21st birthday party. The response has been fantastic with everyone saying how brilliant you were. We are looking to book you at one of business events next year. Sue Hogg, party at Cardiff Castle. Just a quick note to thank you for entertaining us last night. I have received numerous comments from colleagues this morning saying how much they enjoyed your act. Ginevra S, Kraft Foods, Cheltenham. …can be used as a short finale (mini cabaret) to a party with either the sawing in half illusion or the levitation of a volunteer. This can follow some close-up magic and provides an impressive spectacle as a finale to the entertainment.